This week, the Trump administration took the surprising step of releasing some immigrant parents from detention in order to reunite them with their children who had been separated from them at the U.S.-Mexico border. Those tearful, chaotic reunions were documented across the country, showing smiling parents bouncing babies on their laps. But if the words exchanged recently in federal Judge Dana M. Sabraw’s San Diego courtroom are to be believed, the hundreds, perhaps thousands, of parents who are still waiting to get their kids back might not face that same fate anytime soon. “The authority to detain and to parole are critical to the government,” Scott Stewart, the head of the immigration litigation office at the U.S. Department of Justice, told Sabraw yesterday. He explained that as the government faces Sabraw’s deadline of reuniting more than 2,000 children with their parents by July 26, officials may give remaining parents in immigration detention two choices: Agree to be detained with their children — and give up their children’s rights under the 1997 Flores agreement to be released after 20 days — or release their children to the custody of the federal government. In other words: “The family could stay detained” together for longer than 20 days, Stewart said, or “the family would be separated, but with the parent’s consent.” Just because immigrant families must be reunited doesn’t mean that parents can “bootstrap a right to release” from immigration detention, he continued. A lawyer for the American Civil Liberties Union, which brought a class-action lawsuit against the Trump administration over family separation earlier this year, said in court that he did not disagree with that interpretation — though he did say he thought parents in immigration detention centers might win the right to release if they brought a separate lawsuit. Sabraw didn’t appear to disagree either. “This might be the happy situation where ... you are agreeing with what the government has outlined,” Sabraw told the ACLU lawyer on Tuesday. He asked that the Trump administration and ACLU get together on some legal language he could approve; as of Wednesday evening, it had not yet been filed with the court. Geoffrey Hoffman, director of the Immigration Clinic at the University of Houston Law Center, was disturbed by the exchange after being told about it Wednesday: “My reading of this is, the government’s position is that they do not have to release anybody” from immigration detention. Hoffman worried that by offering immigrant parents a difficult choice of either staying detained with their children or staying separated from them, the government was opening up the possibility for abuse of the system. “There’s a concern that people will misunderstand whatever form they’re being given, [or] not be given any legal representation” while they sign it, Hoffman said. "That is very problematic with respect to people who don't speak the language" and people who probably don't have the education level of an attorney. A spokesperson for Immigration and Customs Enforcement, which is responsible for the nation’s immigration detention centers, redirected queries about Stewart’s statements to the U.S. Department of Justice, which declined to comment. A spokesperson for the U.S. Department of Health and Human Services, which takes custody of immigration children after they’ve been separated from their parents, did not respond to requests for comment Wednesday. ACLU lawyers also did not respond to requests for comment. Tuesday marked a court-ordered deadline for the federal government to reunite dozens of immigrant children under the age of 5 from their parents. Most families had been divided as part of the Trump administration’s now-reversed practice of separating them upon crossing the border illegally — though some had also been separated before the policy became official, and some had been separated after seeking asylum legally at official ports of entry into the United States. Department of Justice lawyers told Sabraw on Tuesday that they would reunite at least 38 children with their parents by the deadline, and Sabraw asked them to reunite around 60. It’s not clear if they pulled it off or when the remaining children will see their parents. U.S. Department of Homeland Security official Matthew Albence told reporters Tuesday that ICE officers were strapping families with ankle bracelets and releasing them as they wait to go through immigration proceedings. Only about an hour later did Stewart indicate that the government was exploring legal avenues to stop that practice — which President Donald Trump pejoratively calls “catch and release” — and instead keep parents in detention, with or without their kids. Stewart’s statements came after the Trump administration was dealt a blow in its efforts to keep immigrant families in detention indefinitely. A different federal judge ruled against this effort, but left Trump a loophole: Children and their parents could stay in detention together past a court-ordered 20-day limit, but only with the parents’ consent. Trump officials are arguing that they can take advantage of that loophole. Stewart also made clear that if Sabraw, the San Diego judge, disagreed with his interpretation — or takes steps to require the government to release detained parents — the government would appeal or seek a stay of Sabraw’s reunification order. But that seemed unlikely based on the discussion in his courtroom on Tuesday. If Sabraw gives the green light, Stewart said "we will proceed on that sort of implementation" that he outlined. Officials could begin seeking to indefinitely detain families — or give parents the option of remaining separated from their children — within days. Since more than 2,000 children over the age of 5 must be reunited with their parents by July 26 under Sabraw’s order, that means federal officials would either need to find space to house hundreds of families in ICE facilities or put kids back into the custody of the federal government. The U.S. Department of Defense is currently assessing whether Fort Bliss in El Paso and Goodfellow Air Force Base in San Angelo are viable sites to house thousands of immigrant families — though they won’t break ground on the facilities until the Department of Homeland Security and Department of Health and Human Services sign off on the plan. Meanwhile, in Congress Wednesday, Republican members of the House Appropriations Committee appeared to take steps toward the same goal. U.S. Rep. Tom Cole, R-Oklahoma, introduced an amendment to a wide-ranging House appropriations bill that would codify the government’s right to detain families together — and take that debate out of the courts. Republicans approved the amendment, though both chambers must pass the bill for it to become law. Some parents who have been separated from their children could still get released from immigration if they can afford to pay bond. The bond amount is set by ICE (at a minimum of $1,500), and can be renegotiated in front of an immigration judge. But not all adults in immigration detention are eligible for bond. And those who managed to get out on bond wouldn’t immediately get to see their children. The children would still be in foster care, with another guardian or in a government-overseen shelter. 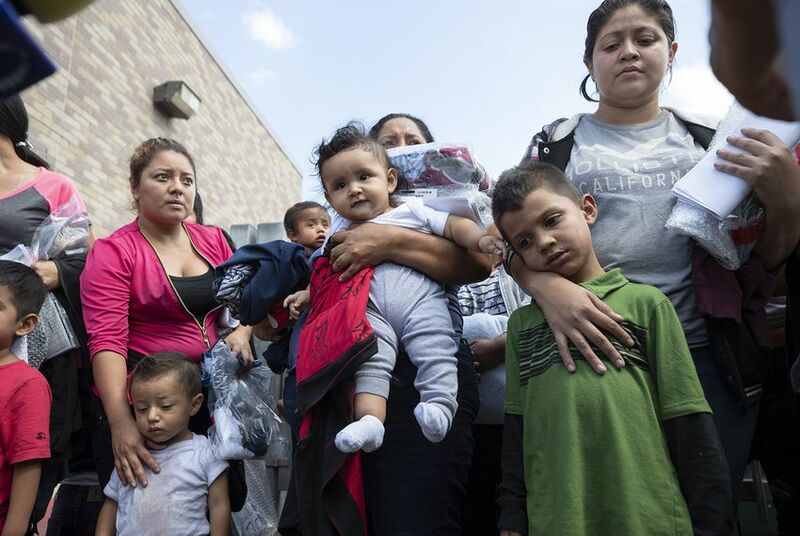 Jodi Goodwin, an immigration lawyer with about 15 clients who have been separated from their children, said two of them had bonded out of the Port Isabel Detention Center in South Texas as of Wednesday afternoon. Both have children over the age of 5, so the deadline for reunification is two weeks away. But the government is asking for a lot of paperwork, and it’s even asking to fingerprint the parents although Sabraw said that is not necessary, according to Goodwin. “I have absolutely zero confidence whatsoever that ICE will reunify any of my clients' children with them by the deadline,” Goodwin said.